Q: Students are not showing enthusiasm for greeting the way they did earlier in the year. What can I do? A: First of all, consider why students may be losing enthusiasm. Possibly they’ve turned a developmental corner. For example, greetings that felt safe and right for mostly seven-year-olds might be feeling too narrow for eight-year-olds, who crave sanctioned ways to vent their boisterous side. Look for greetings that fit students developmentally and you’ll likely see a revival of enthusiasm. Or perhaps you simply need more variety in your greetings. Take a look at the week as a whole and then find ways to vary the greetings from day to day. 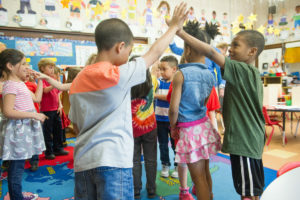 One day, pass a greeting around the circle; another day, do a group chant as a greeting; another day, do a greeting that gets children up and moving around the room or gives them a choice of whom to greet. Next week, switch to other greetings of the same types. Here’s a greeting that gets students up and moving while also practicing their math facts. Students move around trying to find the match for their card. When students find their match, they greet each other. A simple “Hello” or “Good morning” is fine. Going around the circle, students announce their equation while holding up their cards so all can see. This next one’s fun when you want to rein in the movement a bit by keeping students in the circle rather than moving around the meeting space. Q: I want students to have fun, but when we do bouncy, loud greetings, they tend to get silly and forget to take the act of greeting seriously. What can I do? A: You’re right to be concerned about greetings becoming silly. It helps to focus on engagement rather than entertainment or frivolity. Remember that although greetings do need to be engaging, they don’t always need to be bouncy and loud. First, it’s not your role as a teacher to entertain students. Second, the best learning comes from engagement, which can take the form of deep concentration, even fascination, as well as playfulness and laughter. So instead trying to make greetings entertaining for students, look for those that will engage them. Here are a couple to try. Holding a ball of yarn, a student greets someone across the circle and gently rolls the ball to that person while firmly holding on to the end of the yarn. The student who receives the ball of yarn greets another student across the circle and rolls the ball to that student, making sure to hold onto the unraveling strand with one hand. This continues until everyone has been greeted and the yarn has created a web across the circle. To unravel the web, students greet each other in reverse order until the ball of yarn is wound up again. The student being greeted waits until the airplane lands and then retrieves it. (Remind students that only the person being greeted retrieves the airplane.) He returns the greeting: “Good morning, ______!” and chooses someone else to greet. Repeat until everyone has been greeted. Q: Coming up with enough greetings to keep things varied and fun takes time—the one thing I don’t have! How can I keep up? A: Variety is important, but that doesn’t mean you have to change the greeting every day. It’s more important to gauge students’ interest level: If they’re enjoying a greeting—perhaps even asking for it—keep using it! But it’s also a good idea to continue building the class’s stock so you can switch things up when you need to. One way to gather new greetings is to ask colleagues to share ones their students enjoy. And remember that students themselves are excellent resources. When you ask for their help adapting familiar greetings or even coming up with new ones, their enthusiasm is sure to rise. Here’s a greeting devised by a fourth grader. It can be adapted for all grade levels and is especially useful early in the year when students are learning one another’s names. The whole class begins chanting the refrain: Say your name and when you do, we will say it back to you! The first child then says his or her name aloud: Melanie! In unison, the whole class repeats the name: Melanie! The whole class chants the refrain again as the greeting continues around the circle. Say Your Name is an example of a greeting that can be easily varied to feel new. Each student can use a different voice—soft, deep, high-pitched, spooky, etc.—which the whole class then echoes. Students can sing the refrain in rap style, add hand-clapping and thigh tapping, or clap out the number of syllables in their names. To make the greeting livelier, students can add a movement to go with their names, which the class then mimics when they repeat the name. Here’s another greeting that’s easy to vary. A bonus: it folds in sharing for those busy days when you have less time for Morning Meeting. Students tiptoe around the room to find a partner and greet them with a handshake. Partners then tell each other their favorite book. Ring a bell to signal a new round. Call out three new directions. Students move, greet, and share in those designated ways. Continue for three or four rounds. 80 Morning Meeting Ideas for Grades K–2. Susan Lattanzi Roser. 80 Morning Meeting Ideas for Grades 3–6. Carol Davis. 99 Activities and Greetings: Great for Morning Meeting . . . and other meetings, too! Melissa Correa-Connolly. Doing Math in Morning Meeting: 150 Quick Activities That Connect to Your Curriculum. Andy Dousis and Margaret Berry Wilson. Doing Science in Morning Meeting: 150 Quick Activities That Connect to Your Curriculum. Lara Webb and Margaret Berry Wilson. The Morning Meeting Book, 3rd edition. Roxann Kriete and Carol Davis. 2014. Check out our Morning Meeting for Beginners board on Pinterest! In a world where students can learn to be polite greetings can teach social skills. Amazing article in truly developing socially emotional scholars. I think greeting your students in a friendly, warm manner sets the tone for the class. The teachers that greeted me in the morning when I was a child with genuine enthusiasm made me feel special and motivated me to learn from them.